Exquisite SKY SURFER is top of the line! 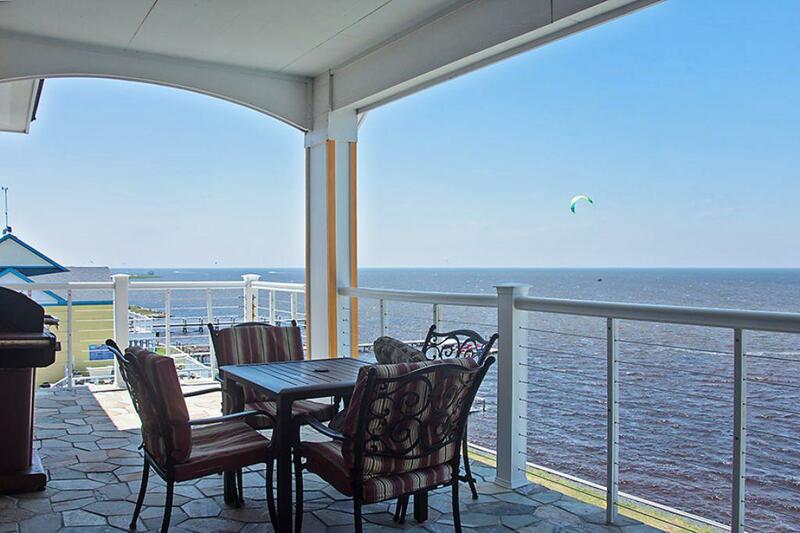 This is a top floor, south corner condo with panoramic water views! The waterfront living area has upscale resort rosewood and leather furniture, surround sound, vaulted ceilings. Enjoy nightly sunsets through huge 10' sliders. The long private furnished soundfront and oceanview corner deck has a private hot tub and gas grill. SKY SURFER is simply breathtaking! Flooring is a warm wood laminate with tile accents. The open kitchen has stainless appliances, soapstone counters, breakfast bar great for entertaining and meals! BR1 is a king master with tiled shower. BR2 is a queen master with deck access and tile shower. BR3 is a large king master with huge south window and tiled bath with large Jacuzzi tub. Queen sleep sofa in living room. Guests can harness the power of the equipment and instructors of onsite Kitty Hawks Kites store for the vacation of a lifetime. Waves Village Resort is full service - onsite staff, onsite Good Winds Restaurant & Bar, surf shop, coffee shop, and NEW onsite ropes course. Fun and activities for all ages! Amenities include: outdoor pool & sundeck, outdoor shower, onsite kiteboarding/ watersports, air pumps, gear storage w/board racks. Elevator access, Washer/Dryer, Beds Made. Pet friendly (fee). WiFi.